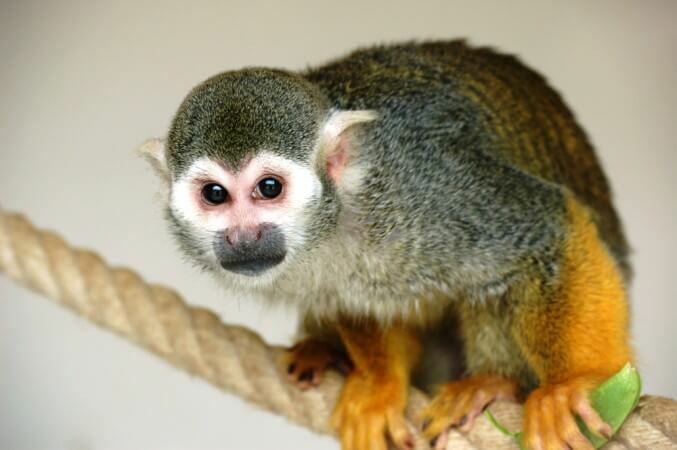 Squirrel Monkeys are small primates with short, close fur. They have green coloured shoulders but are a yellowish orange on the rest of their body with white ears and a black mouth. Habitat: They live in the tropical forests of Central and South America. Population: Squirrel Monkeys are currently not endangered. Lifespan: Their life expectancy can be up to 20 years. Diet: The Squirrel Monkey is an omnivore, eating mostly fruits and insects. Behaviour: Squirrel Monkeys live together in groups of up to 500 members. They have a number of vocal calls, including warning sounds to protect themselves from predators. Their small body size also makes them susceptible to predators such as snakes.